As we can see, MySQL 5.5.8 comes with great improvements and scalability fixes. Adding up allÂ the new features, you haveÂ a great release. However, there is one area I want to touch on in this post. At Percona, weÂ consider itÂ important not only to have the best peak performance, butÂ also stable and predictable performance. I refer you to Peter’s post, Performance Optimization and Six Sigma. In Percona Server (and actually even before that, in percona-patches builds for 5.0), we added adaptive checkpoint algorithms, and later the InnoDB-plugin included an implementation ofÂ Â “adaptive flushing”. This post shows theÂ differences between them and MySQL. For this post, I made tpcc-runs on our Dell PowerEdge R900 box, using RAID10 over 8 disks and a FusionIO 320GB MLC card. 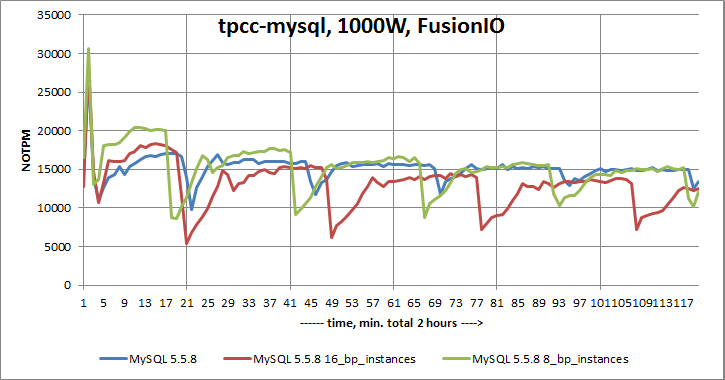 First,Â the results for tpcc-mysql, 500w (around 50GB of data) on RAID10. I used innodb_buffer_pool_size=24G, innodb_log_file_size=2000M (innodb_log_files_in_group=2), and innodb_flush_log_at_trx_commit=2. Also, innodb_adaptive_flushing (ON) / innodb_adaptive_checkpoint (estimate) were the default values. The raw results, full config files, and scripts areÂ in ourÂ Benchmarks Wiki. Although it takes a decent time for the Percona Server results to stabilize, for MySQL 5.5.8 we have regular dipsÂ (3 times per hour) from 24900 NOTPM to 17700 NOTPM (dips of around 30%). Next, the second run on the FusionIO card. There I should say that we were not able to get stable results with the existing adaptive_checkpoint or adaptive_flushing algorithms. So, Yasufumi invested a lot of research timeÂ and came up with the new innodb_adaptive_checkpoint=”keep_average” method. This method requires settingÂ innodb_flush_neighbor_pages=0 , to disable flushing of neighborhood pages (not available in MySQL 5.5.8). The problem with flushing neighborhood pages is that it makes an exact calculation of how many pages were handled impossible. The flushing neighborhoods feature wasÂ created as an optimization for hard drives, since InnoDB tries to combine writing as many pagesÂ as possible into a single sequential write, which means that a single I/O may have a size of 32K, 64K, 96K, …, etc. And again, that makes a prediction of how many I/O operationsÂ thereÂ are impossible. Furthermore, this optimization is not needed for flash devices, like FusionIO or Virident cards. An additional optimization we have for SSDs is big log files. For this run, I used innodb_log_file_size=4G (innodb_log_files_in_group=2) for Percona Server. That gave 8GB in total sizeÂ for log files (MySQL 5.5.8 has aÂ 4GB limit). In additional to increasing log_size we added option innodb_log_block_size which allows to change IO block size for logs files. Default is 512 bytes, in test with FusionIO I use 4096 bytes, to align IO with internal FusionIO size. You can see that MySQL 5.5.8 has periodic drops here, too. 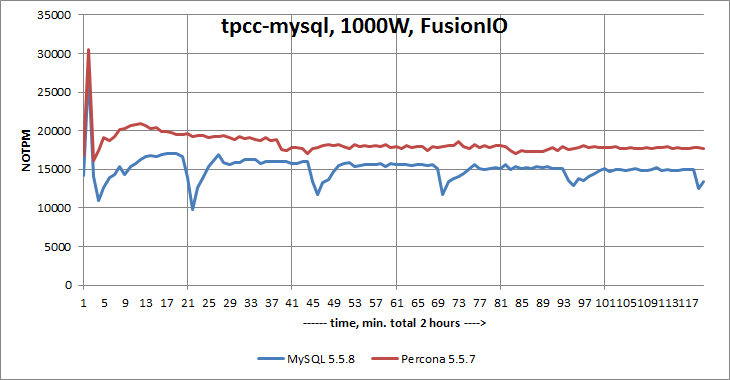 TheÂ margin between Percona Server and MySQL is about 2500-2800 NOTPM (~15% difference). MySQL 5.5.8 now has featuresÂ related to havingÂ several buffer pool instancesÂ that are supposed to fix the buffer poolÂ scalability issue. Let’s see how MySQL performance changes for the last workload if we set innodb_buffer_pool_instances=8 or 16. As you see, having several buffer pools makes the dips deeper and longer. It seems that for Percona Server the best choice is innodb_buffer_pool_instances=1, as we implemented buffer pool scalability in a different way. 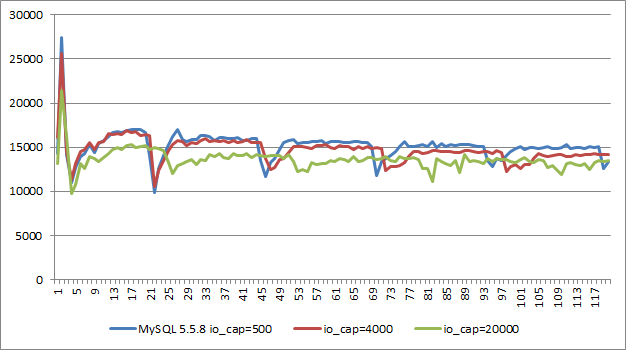 By request from commenter I put also results with different innodb_io_capacity for MySQL 5.5.8. It is 500 ( which I used in benchmarks above), 4000 and 20000. As you see there is no improvements from bigger innodb_io_capacity, and it also concurs with my previous experience, that with bigger io_capacity you rather getting worse results. 1) Compare the 1st graph with the 2nd graph, you got around 25000 NOTPM on hard drives but less than 20000 NOTPM on FusionIO. I’d expect the results for FusionIO to be much higher than that of HDD, but that’s not the case here. Why is that? 2) the settings you used for FusionIO such as innodb_flush_neighbor_pages=0, would that also work for SATA SSD such as Intel X25? 3) You used innodb_io_capacity=500 for FusionIO. That implies an IO capacity of 500 IOPS, right? But FusionIO can do much higher than that. Why didn’t you use a higher value of innodb_io_capacity? * Regarding tests with Buffer Pool instances: did you monitor on which mutexes a contention become more hot??.. – I’m very curious because on my tests I’ve obtained a completely opposite results.. – 16 instances are giving more than 50% better performance..
* Then with a REDO log block size it’s a good point – 4K is the most optimal I/O size for SSD! – however, I have a doubt it makes a huge difference while innodb_flush_log_at_trx_commit=2 is used.. So, to prove it you should present XtraDB results comparing innodb_log_block_size=4096 and 512, may you present them here?.. 1) for FusionIO I use 1000W, and for hard drive 500W, that is FusionIO case has 2x more data. 3) innodb_io_capacity is tricky parameter, it is not directly corresponds to IOS, in my benchmarks it did not show much benefit to go over 500, but as drawback you can easily saturate your IO system. But Dimitri has good point, I may try big value for MySQL 5.5.8. Ok, I should try MySQL 5.5 with big innodb_io_capacity. I just remember it did not do any good for Percona Server, but may be different. I do not have stats for mutexes, sorry. Regarding innodb_log_block_size and innodb_flush_log_at_trx_commit=2, I think log_sys->mutex, it still in hot list, and innodb_log_block_size=4096 allows to decrease time spent under mutex. * I agree that adaptive_flushing needs more work. One of the things that we did in 5.5 is to make it more accurate. As you know master thread does the adaptive_flushing check every second in a loop. In InnoDB plugin for 5.1 if master thread ends up doing some flushing work in one iteration it won’t sleep and would do the next iteration right away. That means it can do multiple batches in one second. In 5.5 we tidied it up a little and forced master thread to sleep for ‘1 – time spent in flusing’ seconds. What that means is that adaptive_flushing will do a maximum of one innodb_io_capacity batch in one second. Seeing the pattern above and the capabilities of the system you are benchmarking on I’d suggest setting innodb_io_capacity to something more realistic than 500. I’d say something like 4000 won’t be a bad idea. adaptive_flushing is heavily dependent on innodb_io_capacity i.e. : the batch size is capped by this value. * Assuming your workload to be much like dbt2, I don’t think purge should be a concern. But to keep master thread free of getting stuck in purge maybe it is a good idea to use innodb_purge_threads = 1. Thanks, I accept your suggestions. I did try innodb_purge_threads = 1, but I did not see much effect from it under this workload. I am re-running tests with innodb_io_capacity=4000 and 20000 for FusionIO case and I will update post when I have it. You set the log block size to 4K to align with FusionIO size. What about non-log IO such as IO for table and index data? Is it necessary to set block size for them too? Table and index data IO is 16K and it is not problem, as it is just 4 internal IO for FusionIO. tables and indexes) into different location, i.e. RAID10. And that’s why we have feature in Percona Server to set innodb_doublewrite_file= , to set doublewrite in different from ibdata1 location. I thought all the doublewrite data is stored in ibdata1. Are you saying you can set it to be stored somewhere else? What is the name of the doublewrite file? So tables and indexes should be stored in SSD, ibdata1 in RAID 10, and doublewrite file somewhere else other than ibdata1’s RAID 10? Can you clarify? How should I use innodb_doublewrite_file=? Can you give an example? doublewrite is stored in ibdata1. so if you decided to put ibdata1 on RAID10 you do not need additional actions. innodb_doublewrite_file= is available only in recent Percona Server releases. in this case double write area will be located outside of ibdata1. Vadim — is this a problem in Percona? That is, is it possible for threads handling user connections to request page writes when the async checkpoint limit has been reached? And if it does submit write requests, does it block for them to finish? That is the case for official InnoDB which means that foreground threads block on IO to be done by background threads and can add lots of pauses. I updated post with result with different innodb_io_capacity. I do not see much improvements with 4000, and it getting rather bad with 20000. BTW, how many concurrent user sessions were used during your test? and how many CPU/cores do you have on your server? it is 16 cores system and I used 16 users. I propose you to wait our patches available for 5.5.8, we will provide .tar.gz for that version. Re innodb_io_capacity I think this option is “evil” to begin with. It would be much better to have database to balance to use capacity of storage it has available (probably self tuning based on IO performance it is getting) as there are many ways IO storage can vary a lot during run time. Think shared SAN storage, LVM snapshots or cloud for example. Thanks for sharing this amazing testing.Just one minor question: where can i get the above “tcpp-mysql” tool ? It should not be problem in Percona, we should have it resolved in our adaptive_checkpoint methods. Any particular reason you used different data for the HDD and FusionIO tests? It’s frustrating because you robbed us of an opportunity to compare the performance of the two types of storage. I’ve get a look on LP – there are only patches, without any info what to do and how to apply them..
so, yes, I may only wait for your 5.5.8 tar.gz..
And the last: may you finally present the result comparing 512 and 4K bytes in redo log block size?.. – you just told it improves performance on SSD but without giving any numbers..
I’ve done about 100 different combinations, I basically can’t publish them all. The reader will be lost and it also requires a lot of time to prepare. I published what I think is most interesting ones. We have Makefile in our directory with patches, and make does all dirty job for applying patches. but point is taken, I added README, please check. I may publish innodb_log_block_size later. 1.) Previous versions of MySql had a size restriction of 4GB per table. So does MySql 5.5.8 has any such restriction? 2.) How many Schema’s can we prepare in MySql 5.5.8? 3.) Is there any limit for number of Columns a table can contain in MySql 5.5.8 ? When will Percona Server 5.1 will stable and available?